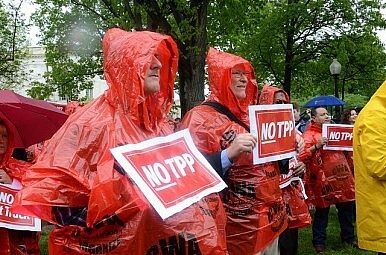 The TPP should not be considered in isolation. Former Secretary of State Hillary Clinton has been criticized for not supporting the Trans-Pacific Partnership (TPP) trade agreement negotiated by the Obama Administration. As Secretary of State, she hoped the TPP would be negotiated as a high-standard trade agreement. But she concluded that unfortunately, the hopes she had were not met in the final terms of the agreement and therefore she cannot support the agreement. The critics’ rap was that she was changing positions for political reasons. So is there a contradiction between the position Clinton took as secretary of State and the one she is taking now? I don’t think so. Hillary has always set what she has called a very high bar for this agreement, and she does not think the agreement gets over that bar. She has consistently said that any trade agreement must meet three criteria for her to support it – creating more good jobs for American workers, raising wages, and advancing our national security. We understand from various negotiators that progress was made at the last meeting which led to this “agreement.” Clinton noted that the Obama team led by U.S. Trade Negotiator Michael Froman had worked to improve earlier versions of the draft. Team members said that important changes were made to chapters and inside agreements in the voluminous text, which earlier reports had said needed to be improved. Many important issues needed to be resolved as is always the case in these trade negotiations. That is why the negotiations go on for years. The issues include but are not limited to better market access for key U.S. agricultural commodities such as beef and dairy. U.S. unions have pressed hard for better guarantees of labor rights. There are issues with investor-state dispute settlement arrangements. There were disagreements about how much local content is required for an automobile to be ruled domestic or foreign. Setting and enforcing rules to discipline nations that manipulate their currencies to grab a competitive price advantage also remains a concern for some American business interests. U.S. pharmaceutical companies want patent protection, especially for new biological medicines. There is an enormous amount of complexity and history in these negotiations, and balancing the benefits against the costs is always a close call that requires care and judgment. Clinton has direct, first-hand experience with this process. When President Barack Obama inherited the U.S.-Korean Trade Agreement, negotiated by his predecessor, Secretary Clinton got together with other Cabinet members and pushed hard to get a better agreement. She got some things but has been disappointed by the overall outcome of this effort, and she has said so. That is why she has set a higher bar this time, citing currency manipulation and greater pharma benefits at the expense of patients and consumers. Her position indicates once again the importance of experience and practical knowledge. An agreement like the TPP makes sense if it is blended with other policies that increase the competitiveness of U.S. workers and economic sectors. To fully benefit from any trade agreement, the United States also must have strong macroeconomic growth policies, paired with a competitiveness agenda to educate and equip its workers, invest in cost-reducing infrastructure and fund basic research and development so that its workers and businesses stay ahead. Leading Republican presidential candidates argue that we must suppress wages to compete on the global trading field, fearing that machines will replace these workers. They paint a static and defeatist future for Americans. Rather, America must invest in human capital – regardless of gender, color, or ethnicity – to prepare Americans to fill roughly two million jobs in engineering and computing that the U.S. is projected to need in the next seven years. And we know that two million jobs is just the tip of the innovation iceberg. Trade agreements, in my experience, are oversold by proponents and opponents alike. The competitiveness problems we face are linked to technological change and modernization at home and in other countries, as well as failings of our own that will not be solved or made greatly worse by trade policy alone. The TPP agreement, in my opinion, may still pass. If it does, it is likely to do so as with other trade agreements before it, in a “lame duck” session of Congress after the November 2016 presidential election. And like most trade agreements, the final vote is likely to be based on geostrategic calculations such as its overall impact on U.S. leadership in the Pacific. A vital thing as we consider the TPP is to remember that it is only a piece of larger issues, all of which require that we better prepare American workers and businesses for the changes taking place in the world so that they can better compete. The next president needs to be prepared to tackle these issues, press for real and dynamic progress, and enforce any trade rules that are in effect. And no candidate is better equipped to do these things than Hillary Clinton. Paula Stern, PhD, was appointed Commissioner of the U.S. International Trade Commission (ITC) by Democrat President Jimmy Carter and designated Chairwoman by Republican President Ronald Reagan. She served as a member of President Bill Clinton’s Advisory Committee on Trade Policy and Negotiations (ACTPN). She chairs The Stern Group, Inc. advising on business, political, and technological developments affecting commercial competitiveness in the global economy. If it is to move forward, the US pivot to Asia is going to need a new point person.